Believe it or not in a previous life (1975-1978), I had a carrier on oil rigs. My world wind career had me working offshore and on land in Iran, the North Sea (UK and Norway), France, Texas, Colorado and Oman (actually didn't start, quit before I was sent there). In less than 2.5 years, I had a meteoric rise in oil and gas exploration, something that I never considered. 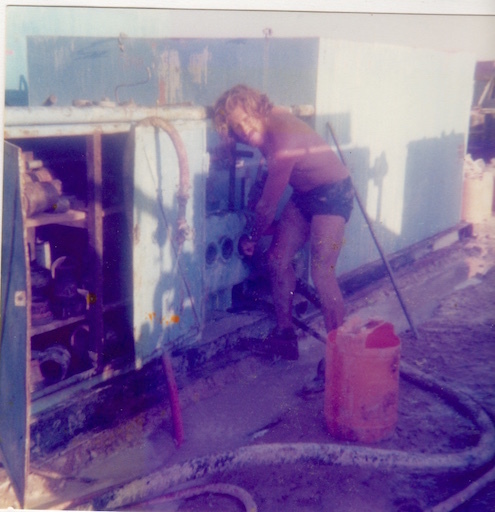 I went from dishwasher, to roustabout (kind of go for), roughneck (guys who all seem to be missing fingers), derrick man (lonely person at top of oil rig snapping pipes with a rope into place to store them) and finally, Air Drilling Engineer. This rapid rise surprised me. It wasn't an inspiring job and as I got to see the environmental destruction we were doing, and the military hierarchy of that company (subsidiary of Schlumberger), further career moves upward were just not appealing. The CEO offered to fast track my career even more, in order to keep me from leaving. The finances were fine, and I worked 4 weeks on and then got 4 weeks holiday (6 months a year). I didn't have to worry about anything. When you finished your 12 hour shift, covered in mud, you dropped your clothes on the ground, and the next day, my room was clean and my work clothes were spotless. We ate wonderful French food, with wine and aperitifs. This was something American rigs wouldn't allow. I remember having long periods of doing nothing, as we worked only if there was a problem with the drilling. If that happened, we would start up the compressors and perform air drilling. Other times, we would have a great deal of free time on our hands and would go exploring the remote areas of Iran. After 4 weeks of working, I had 4 weeks of holiday and I used that time to travel, which expanded my collection of characters. Yes it was very hard work. Hammering a pipe connection in 48 degrees celsius was very exhausting. There was, however, something missing, I wasn't happy or fulfilled and I still needed to find my passion. When I look at some of the photos of working on the rigs, I often think of a tv show called Dirty Jobs hosted by Mike Rowe and the podcast he made about how people doing horrible dirty jobs are financially secure and happy, even though they are not following their passion. I wanted more. Not more stuff or money. I wanted to be fulfilled. What I am doing now, with TBLI, provides that in abundance. Most important, when I am really doing what fulfils me or am in "The Zone" , it costs me no energy, but actually gives me energy. Oh yeah, I don't have to work in dangerous situations, like Hydrogen Sulphide (H2S) gas explosions, or losing fingers when running pipe back into the well. Are you following your heart? Try it. You won't regret it.